For the first time, researchers have discovered two essential components required for habitable planets – water and a rocky surface – existing together outside of our solar system. Researchers from the University of Cambridge, the University of Warwick and the University of Kiel report in the latest edition of the journal Science that they had analyzed the dust and debris surrounding the white dwarf star GD61, which is located some 170 light years away. That dust and debris was the shattered remains of an asteroid that contained considerable amounts of water, the researchers claim. Furthermore, the planetary system surrounding GD61 reportedly had a similar water delivery system to our own, suggesting that it had the potential to contain exoplanets similar in nature to Earth. Researchers have previously located evidence for the existence of water outside of the Milky Way, but only in the atmosphere of gas giants. This research marks the first time that it has been detected in rocky debris, making it of special interest to scientists attempting to gain new insight into how life and habitable planets form and evolve. 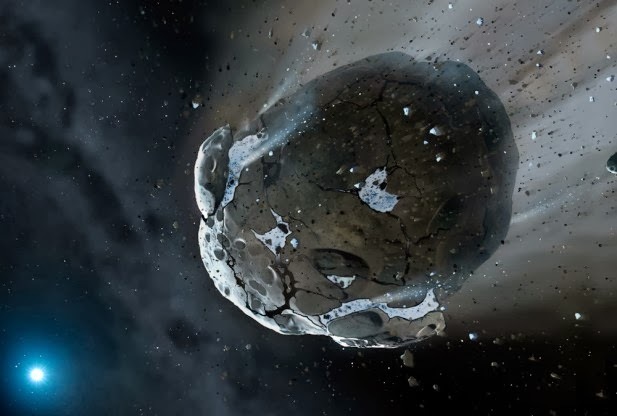 “The finding of water in a large asteroid means the building blocks of habitable planets existed – and maybe still exist – in the GD 61 system, and likely also around substantial number of similar parent stars,” said lead author Dr. Jay Farihi of the Cambridge Institute of Astronomy. The dwarf planet Ceres, discovered in our own solar system, contains ice buried beneath an outer crust. The authors of the new study state that there are several parallels between it and the newly-discovered rocky body. Furthermore, the investigators suggest that the water detected around GD61 probably came from a minor planet that was at least 55 miles (90 km) in diameter that had orbited the parent star before it became a white dwarf. The researchers believe that, like with Ceres, the water on this body was most likely in the form of ice located below the planet’s surface. They discerned the diameter of the disrupted entity based on the amount of rocks and water they detected in the outer envelope of the white dwarf. However, since such observations can only detect recent accumulations, the approximated mass of the planet is said to be somewhat conservative, and that the object was likely as large as Vesta (the largest minor planet in the solar system).